Please read past Graphic Novel Reviews here. Welcome to day five of Oni Press Week! This week I’ll be featuring reviews of a bunch of cool titles from the good folks over at Oni Press. Today, let’s tackle the classic character of Courtney Crumrin. Rating: 10+ I will say that if you know a mature 7+, this book might be good for them as well. Every semester, the students in my graphic novel class ask me for more horror genre graphic novels. I have a few good ones in my class…that I will feature during Horror Week around Halloween, but I’m always on the lookout for some new additions to the collection. This brings me to Courteny Crumrim. I fist discovered CC at my local comic book store a couple of years ago during a title reissue. I bought the first few issues for my classroom, read the first two, and put them on my classroom shelf. Not many students have read them, and that’s partially on me for not pushing it. Fast forward to now: Oni Press Week. Seeing that Vol. 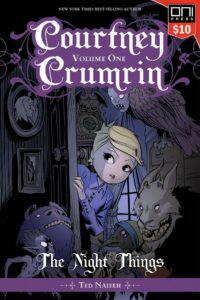 1 of Courtney Crumrim: The Night Things is published through Oni Press, I thought I’d give the series another read for the blog. I forgot how much I love this title! 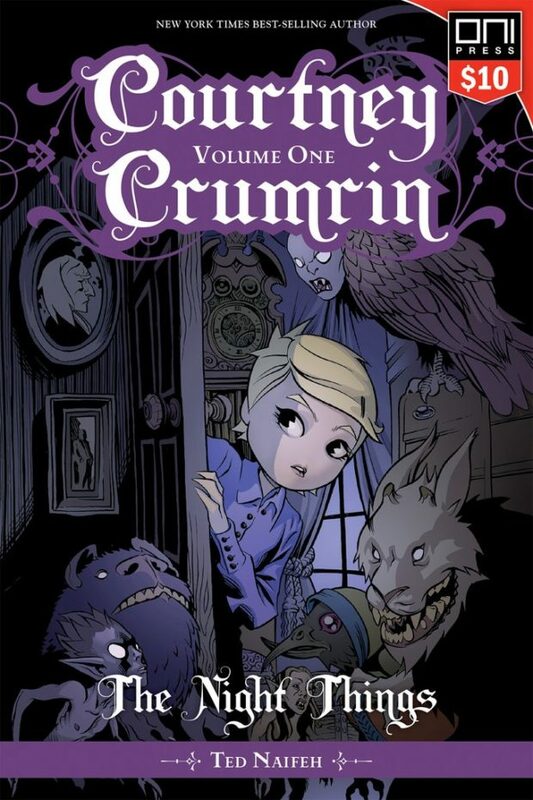 Courtney Crumrim is a no-nonsense fledgling witch that poorly attempts to navigate school and a crazy family that includes her old warlock uncle, but she owns every minute of it and often comes out on top! The series has a sort of Lemony Snicket feel to it as an unseen, slightly humorous narrator fills us in on pertinent information. And while the story is never as depressing as the Series of Unfortunate Events stories, the abundant use of monochromatic blue informs the reader that the story might be slightly dark. I opened with a discussion of horror books. This book is not horror movie scary, but it does contain elements of suspense and horror…I mean a baby gets kidnapped and sold at an auction, and a forest goblin constantly tries to eat neighborhood children (which he sometimes does), but it’s not graphic or too much for kids 13+. I even suggested that giving this book to a mature reader younger than 13 would be fine, if you know the reader well. But, as always, read it first…there are couple of scary images in the book, and we don’t want to cause any nightmares. I honestly enjoyed the book. I’m looking forward to reading more of the series when my 365 reviews are done. Read ahead. Let me know how it goes!